Johann Dillenius (1684-1747) was born in Darmstadt, Germany and came to England in 1721 with a prodigious botanical reputation, based on his publication Catalogus plantarum sponte circa Gissam nascentium (1719). Under the patronage of William Sherard (1659-1728), Dillenius' reputation increased and, at Sherard's insistence, he eventually became the first Sherardian Professor of Botany in 1734. Dillenius is perhaps best known for his work on the Hortus Elthamensis (1732), a full-colour, illustrated folio of the plants growing in James Sherard's (1666-1737) garden at Eltham. All of the illustrations were drawn, and the copper plates engraved, by Dillenius. Dillenius was poorly treated by James Sherard during this project and he regretted the time and money he 'wasted' on this project. In 1736, Linnaeus visited Oxford specifically to meet Dillenius and following a famously frosty meeting, they developed a strong friendship. Linnaeus honoured Dillenius through the generic name Dillenia (Dilleniaceae) and with the complement that there was nobody who thought about or understood genera like Dillenius. Linnaeus dedicated his Critica Botanica (1737) to Dillenius. Indeed, Linnaeus was to use extensively Dillenius' most scientifically enduring, and perhaps most original, work, the Historia Muscorum (1741). Dillenius died in 1747 and is buried in the churchyard of St. Peter-in-the-East, Oxford. Dillenius' herbarium, books and manuscripts were purchased by the second Sherardian Professor of Botany, Humphrey Sibthorp (1712-1797) and are now part of the collection in the Department of Plant Sciences, University of Oxford. In the Historia Muscorum, Dillenius attempted to enumerate all of the 'lower plants' that he knew in 576 pages of Latin text and 85 plates. As with the Hortus, the plates were drawn and engraved by Dillenius. The Historia Muscorum comprises 20 Dillenian 'genera' in the main text and an additional four 'genera' in the Appendix. In total, 661 taxa are recognised, which includes fungi, lichens, algae, mosses, liverworts, hornworts and lycopods. Each entry comprises a detailed description and synonymy, together with their uses. Two hundred and fifty copies of the Historia were published and cost one guinea each but the book sold poorly and was a financial failure. Dillenius attempted to recoup his loses by preparing an abridged version that contained only names, habitats and short notes and would sell for half a guinea. The abridged manuscript exists (MS Sherard 210) but was never published. The taxa in the Historia Muscorum are associated with specimens in Dillenius' herbarium, titled by Dillenius 'Specimina Muscorum in Historia Muscorum descriptorum, agglutinata Februario 1744, immixto glutini vulg. 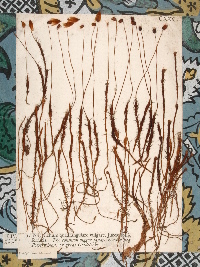 non edulcarato' and described by Druce and Vines (1907) as the 'Herbarium of the Historia Muscorum'. Dillenius was well aware that some organisms were better preserved by drying than others; he was, after all, engaged in producing s series of paintings of macroscopic fungi (MS Sherard 209). The Historia Muscorum is associated with a herbarium of 901 entries mounted on 176 sheets; approximately 16% of the entries have been annotated as types. The collection is highly distinctive. Each sheet contains multiple taxa, and often multiple specimens under each polynomial name. Taxa are usually named with the polynomial and trivial names clipped from a copy of the Historia, together with annotations by Dillenius and other later workers. In some cases, the specimens are replaced by engravings from the Historia. Each sheet (c.320 mm x c.230 mm) is surrounded by a border of 18th century wallpaper off-cuts and mounted on acid-free card in the late-20th century. 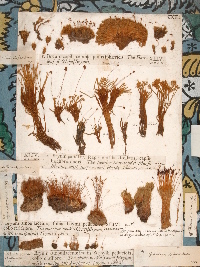 The majority of specimens in the Herbarium of the Historia Muscorum were probably collected by Dillenius; he had made an extensive botanical field trip into Wales in 1726. However, there are numerous known contributors: Johann Amman (1707-1741), John Bartram (1699-1777), Hermann Boerhaave (1668-1738), Samuel Brewer (1670-1743), Johann Philipp Breyne (1680-1764), Rev. Littleton Brown (fl. 1699-1749), William Brownrigg (1711-1800), Adam Buddle (c.1660-1715), Mark Catesby (1679/80-1749), Olof Celsius (1670-1756), John Clayton ((1686-1773), Rev. Thomas Cole (fl. 1730), Peter Collinson (1694-1768), Charles Deering (1695?-1749), Rev. William Green (fl. 1726-1740), Jan Frederik Gronovius (1690-1762), William Harrison (fl. 1740), Carl Linnaeus (1707-1778), Rev. Thomas Manningham (1684-1750), John Mitchell (d. 1768), Guiseppe Monti (1682-1760), Richard Richardson (1663-1741), Rev. Thomas Shaw (1693-1751), Hans Sloane (1660-1753), Francis Soldan (fl. 1700-1740), Albert von Haller (1708-1777). 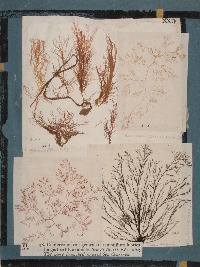 Specimens were also taken from the herbaria of Jacob Bobart (1641-1719), William Sherard and Charles Du Bois (1656-1740). Interpretation of the Herbarium of the Historia Muscorum requires access to both the text and plates of the Historia. Therefore, each entry in the database is associated with images of herbarium sheet, the relevant Historia text and plate and the entry from Druce and Vines (1907; The Dillenian Herbarium. 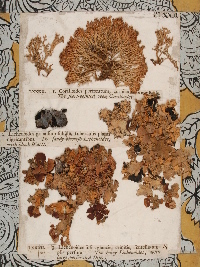 An account of the Dillenian collections in the herbarium of the University of Oxford. Clarendon Press, Oxford). The majority of annotations on the Historia pages are in George Druce's hand. Linnaean names are given according to current sheet determinations, although for some specimens, particularly the mosses and liverworts, there has been little critical examination since the late-19th century. Specimens are known to have been collected from: United Kingdom: Cumberland, Gloucester, London, Manchester, Nottingham, Oxford, Shropshire, Slinfold, Trowbridge, Wales, Yorkshire. Europe and Russia: Germany, Holland, Poland, Russia, Sweden. Americas: Carolinas (North America), Bahamas (Caribbean), Greenland, Jamaica (Caribbean), Pennsylvania (North America), Virginia (North America) and Patagonia.